On location in center are Matias Rygh (left, seated in foreground) and Mathias Eriksen (next to him, wearing hat). 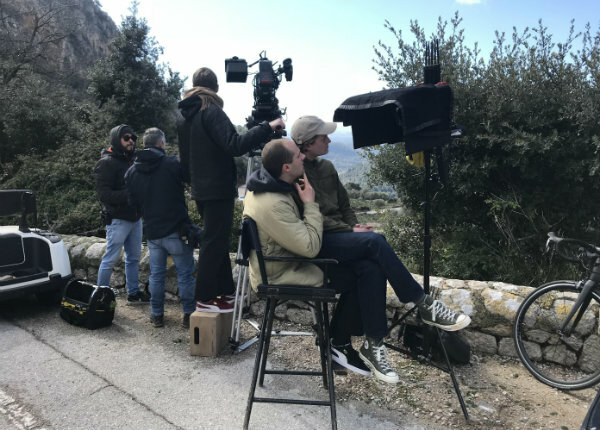 Norwegian directing duo Matias & Mathias has garnered its first U.S. representation, signing with Epoch Films for spots and branded content. Matias Rygh and Mathias Eriksen met in school at the age of 16 and have been friends and collaborators ever since. Their foray into filmmaking began with skate films, which is where they started developing their craft, but it was their dark, visually driven narrative shorts that caught the attention of a producer in Oslo and landed them their first commercial job, a car spot. They were 19 years old. The experience was positive but they chose to continue creating short films for another five years before diving back into advertising. Matias & Mathias began directing commercials again in earnest after signing with Scandinavian production company Bacon in 2016. Through this partnership and the generous mentoring of the other directors at the company, they have received a film education that some would argue outweighs any formal training. Last year their work earned a Bronze Lion at Cannes, Gold and Silver with Epica, and a Bronze at Eurobest. Notable spots include “Vipps” for DNB, which shows a woman literally deflating at the idea of having to get off the couch to make a purchase online; a campaign for Rikstoto, which tells the hypothetical, future-that-will-never-be stories of three characters who will never buy that $10 lotto ticket for a chance to win $2 Million; and their most recent work, “Stories of Success” for Finn.no, a keenly timed parody of parents with high expectations for their children to excel in sports, and the moment they realize it’s time to give up and find a new hobby. Matias & Mathias and Epoch Films are represented on the West Coast by Dexter Randazzo at the Department of Sales; in the Midwest by Chris Brown Representatives; and on the East Coast by Tara Averill, John Robertson and Erin Wahed at Representation Co.
Director Natalie Rae Joins Epoch Films For Spot Representation In U.S.
Swedish director Philippe Tempelman has signed with production company Epoch Films for his first career representation in the U.S.